Wear a symbol of your Christian faith every day with this beautiful women's Faith Saves diamond cross pendant in 14K white gold from Apples of Gold Jewelry for any special occasion! The suface of the cross pendant is decorated with 12 beautiful diamonds, which are rated G-H for color and I1 for clarity. The dozen diamonds on the pendant total at 1/8 carat,or 0.125 carats, making this a piece of jewelry that will always be special. The pendant measures 0.59 inche tall and 0.39 inch wide. "For by grace are ye saved through faith; and that not of yourselves: it is the gift of God:"(Ephesians 2:8). 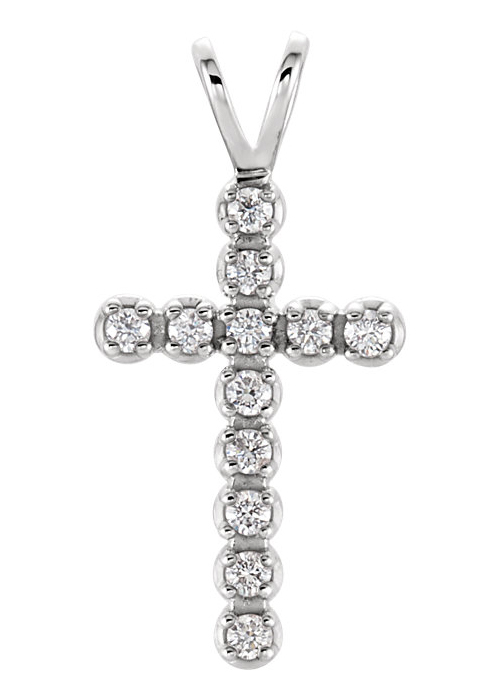 We guarantee our Faith Saves Diamond Cross Pendant, 14K White Gold to be high quality, authentic jewelry, as described above.